Tha raon de dh’Aonadan Nàiseanta rim faotainn aig SQA do luchd-ionnsachaidh na Gàidhlig. Chaidh na h-Aonadan fhoillseachadh aig a’ Mhòd Nàiseanta Rìoghail ann an Steòrnabhagh ann an 2011, agus chaidh an leasachadh le SQA ann an com-pàirteachas le Colaistean na h-Alba, mar oidhirp air dèiligeadh leis an dìth solair a thaobh inbhich a tha airson Gàidhlig ionnsachadh. Tha na h-Aonadan a’ còmhdach nam prìomh ceithir sgilean a dh’fheumar airson cànan ùr ionnsachadh gu soirbheachail – labhairt, èisteachd, leughadh agus sgrìobhadh. Faodar an cur ri Cùrsaichean Nàiseanta, Duaisean Adhartais Nàiseanta (NPAn) agus Barantasan Nàiseanta. Tha Pacannan Taic Measaidh rim faotainn bho làrach-lìn thèarainte SQA. Gus na tionndaidhean às ùire de na Sònrachaidhean Aonaid a lorg, feuch gun cleachd sibh an t-Aonad rannsachaidh againn. Tha na h-Aonadan neo-cheangailte seo freagarrach do raon fharsaing de shuidheachaidhean dreuchdail, a’ brosnachadh luchd-ionnsachaidh gu meòrachadh air na sgilean a dh’fheumar airson so-fhastachd. Faodar an cleachdadh cuideachd ann an co-bhonn le Aonad eile no le buidheann de dh’Aonadan, gus raon de chuspairean inntrigeadh. Is iad na h-Aonadan clachan-stèidh Barantasan Nàiseanta Àrd Ìre (HNC) agus Dioplòmathan Nàiseanta Àrd Ìre (HND) agus is e teisteanasan ceart a th’ annta. Tha cuid de dh’Aonadan a’ leasachadh sgilean Gàidhlig an taobh a-staigh co-theacs co-cheangailte ri obair, agus feadhainn eile a’ leasachadh sgilean èisteachd, labhairt, leughaidh agus sgrìobhaidh. SQA has a range of National Units available for Gaelic learners. 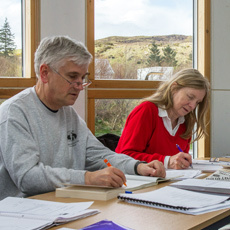 The Units were launched at the Stornoway Royal National Mòd in 2011 and were developed by SQA in partnership with Colleges Scotland in an effort to address the lack of provision for adults who want to learn Gaelic. The Units cover the four key skills required to learn a new language successfully — speaking, listening, reading and writing. They can be built into National Courses, National Progression Awards (NPAs) and National Certificates. Assessment Support Packs are available from SQA’s secure site. To find the most up-to-date versions of the Unit Specifications please use our Unit search. These free-standing Units are suitable for a wide range of vocational settings, encouraging learners to reflect on the skills required for employability. They may also be used in conjunction with another Unit or group of Units to access a range of subject areas. Units are the building blocks of Higher National Certificates (HNCs) and Higher National Diplomas (HNDs) and are qualifications in their own right. There are Units that develop Gaelic language skills within a work-related context, while others develop listening, speaking, reading and writing skills.